Do it at your Desk! 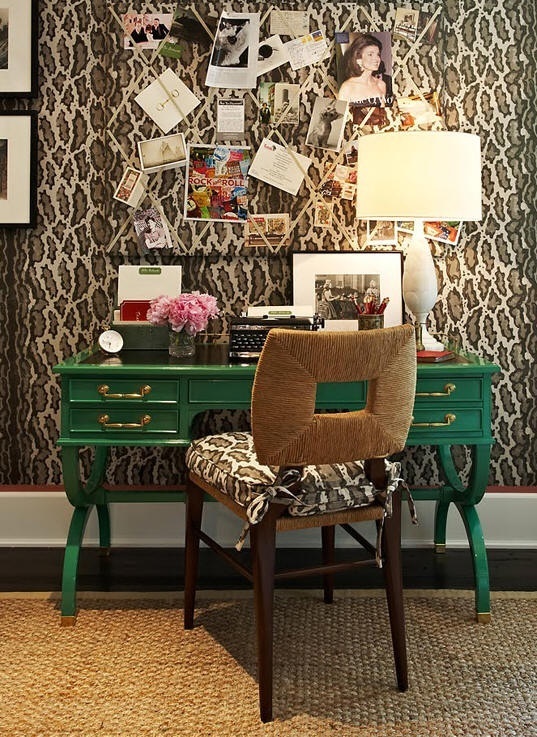 Since I work most of the time now from my Paris apartment desk, I have been collecting ideas for my new dream space. For me, it is so important to have an area that inspires creativity, but also a place with few distractions so that I may concentrate when dealing with numbers and writing my blog posts. I prefer my desk to be a part of my living area, as I do not like to feel isolated. Rarely do I watch television, but enjoy music all the time in my little space. My former home, had a room just for my office, and I never went in there, preferring to write or check emails at the kitchen island, but then had to clean up all my papers when I wanted to cook! As far as a closet space, I would never enjoy looking at a wall when working. My creativity works beautifully when I am surrounded by things that help me daydream, and peak my curiosity. A desk with a view is so important. Use lighting, color, and decor to create a space that reflects your personality, and enlivens the imagination! A wonderful example of a desk in the living space. Choose quality furnishings like the lucite bookcase. 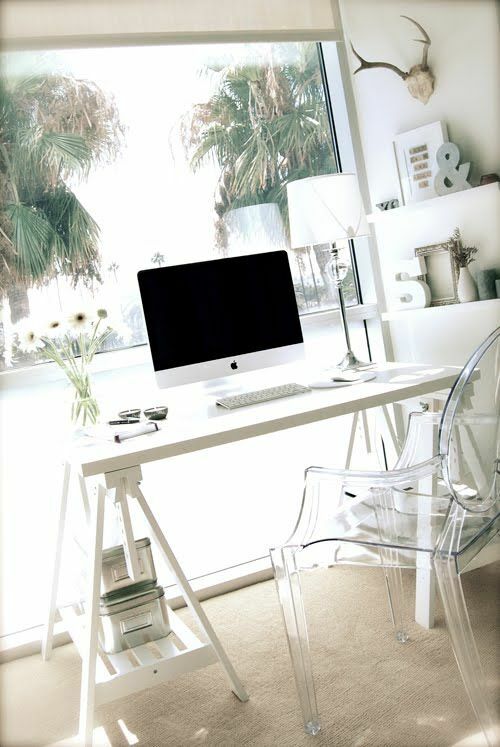 I just adore the painted blue desk. 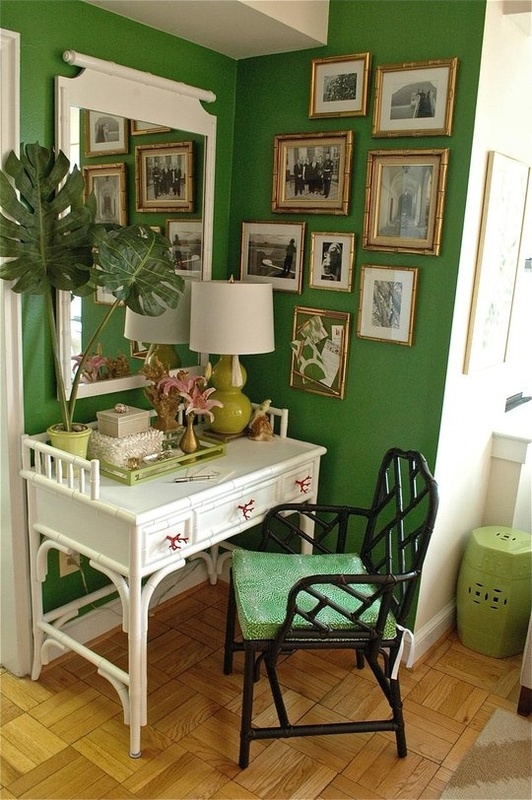 Do not be afraid of using a bold color in your office space. The room would not be the same without it! Lighting is very important, and I prefer the use of a decorative lamp as opposed to an office one. Everything about this desk just makes me sing! I love the wallpaper with the bulletin board layered on top in the same fabric; the white lamp adds an accent of freshness that is a must have for all of my rooms; the painted green desk probably recycled from a garage sale is so chic; and I cannot say enough about this ugly duckling of a chair turned into a swan! This one says Paris..... Oui? This is my kind of space. 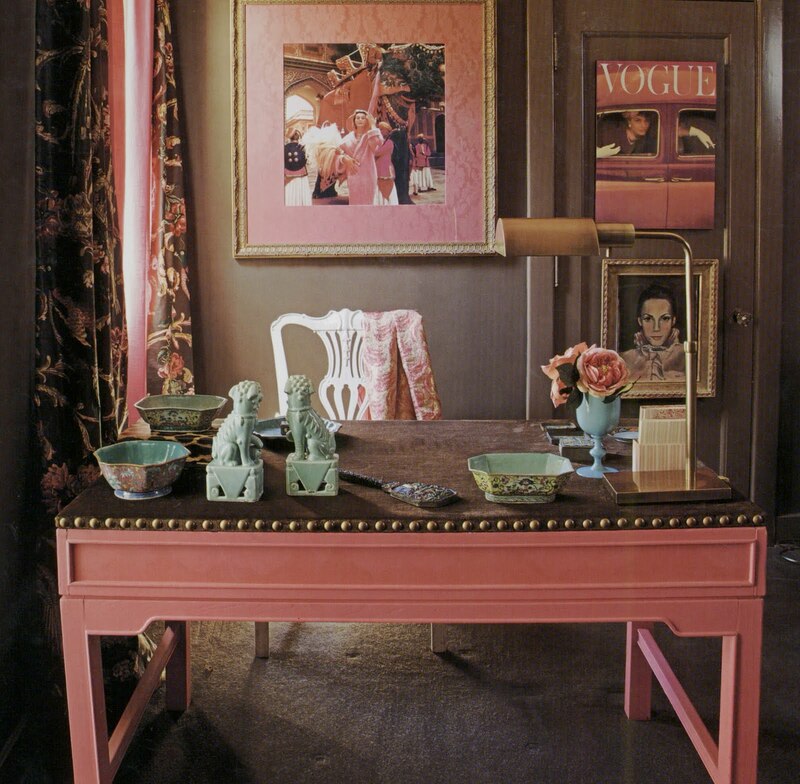 Très chic, design oriented as to become part of a room, a window, painted desk, and pretty flowers. 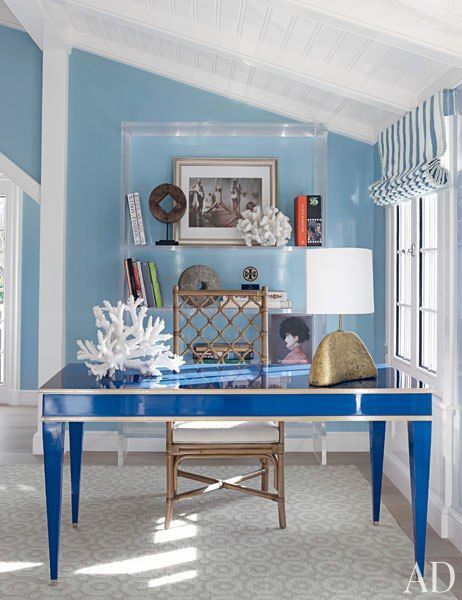 I love the mix of the french chair with the divine peacock blue velvet, the modern desk, the floor lamp not taking up valuable desk space, and the glass table find for the printer from a flea market . 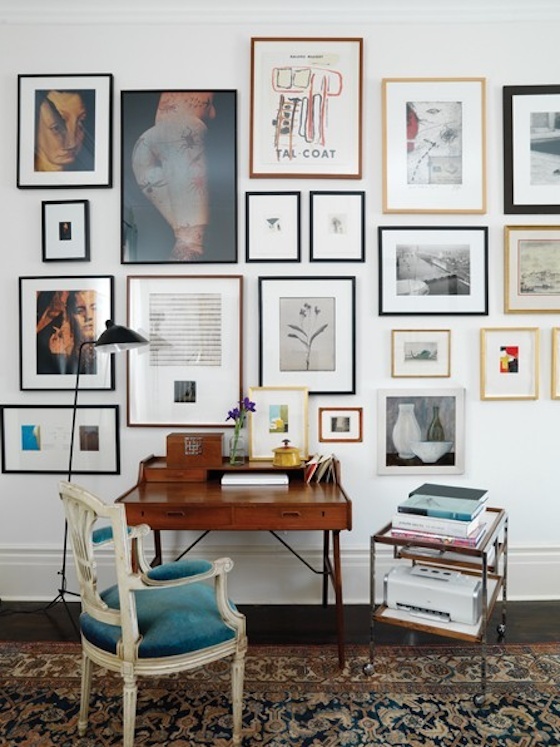 The collage of art on the walls makes this space not have that decorated look. 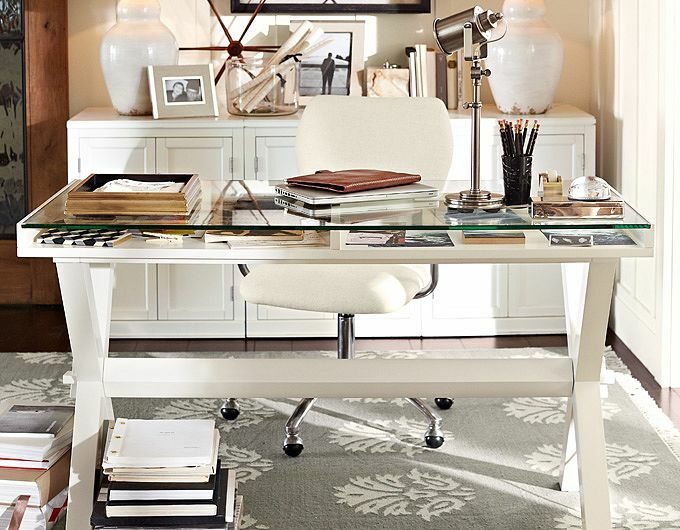 Even though this desk space is from Pottery Barn, I think it is very stylish. I love the white modern feel here. This works for someone who needs instant gratification! 1: Always recover an unattractive office chair, and make sure you have great lighting. 2: I love the clothespins and wire to hang projects or inspiration ideas. 3. If you have a small space, use mirrors to give the illusion of a lighter spacious feel. 4. Re-paint a flea market find to achieve a great one of a kind look for your space, and use a custom fabric covered inspiration board on the wall. 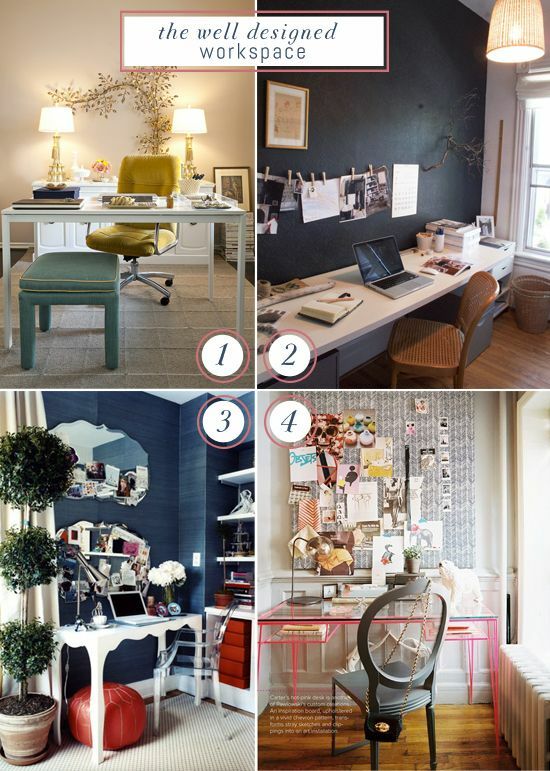 Create a special space of inspiration!